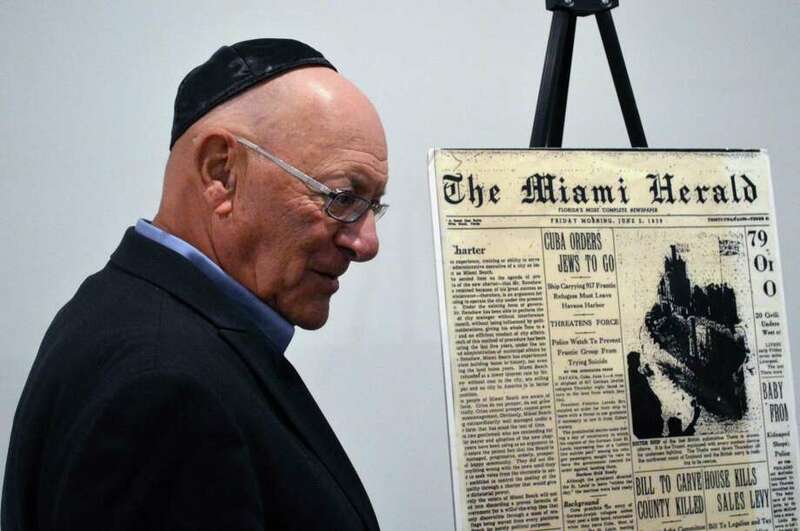 Creator and producer Robert Krakow stands by an old news clipping at the screening of "Complicit," a documentary on the S.S. St. Louis, and a question-and-answer session that included two survivors, Thursday, Jan. 24, 2019, at Chabad Lubavitch of Westport, in Westport, Conn.
WESTPORT — Parallels were drawn Thursday night between one of the darker chapters in U.S. history and current events involving refugees, when Holocaust survivors shared their story of the S.S. St. Louis. This German ship containing 937 Jews — part of a propaganda plan by Adolf Hitler to demonstrate to the world that no country would want Jewish refugees — was refused entry to both the United States and Canada in 1939, with hundreds of its passengers later dying in concentration camps. Chabad Lubavitch of Westport hosted a screening of a documentary called “Complicit,” which not only told the story, but outlined then-President Franklin Roosevelt’s choice to ignore the refugees allegedly to placate some anti-Semitic contingencies in the U.S. and aid his re-election to a third term. Two women who were on the ship as babies, and appear in the film, held a post-screening question-and-answer session, along with creator and producer Robert Krakow. “Roosevelt had the opportunity to assist the Jewish refugees fleeing from Hitler, (but) Roosevelt was a very ambitious politician,” Krakow said. By not accepting those Jews, the film notes, the U.S. and other countries indirectly sanctioned Hitler’s later actions in widespread murders. “Many, many thousands of lives could have been saved,” Krakow said, had Roosevelt offered the refugees a safe harbor. “The ruler of the free world turned his back on us, simply,” said Eva Wiener, who now lives in New Jersey and maintains strong feelings about the United States’ role now in providing refuge to those in need. “Things like this shouldn’t be repeated,” said S.S. St. Louis passenger Judith Steel, who now lives in Queens, N.Y., and who ultimately lost both parents in concentration camps. “I was born in Berlin,” she said. “Jewish people were taken and disappeared,” including her father right after the Kristallnacht, or Night of Broken Glass, on Nov. 9, 1938. The S.S. St. Louis, which set sail from Hamburg, Germany, on May 13, 1939, originally made port in Havana, Cuba, but refugees were turned away. It then anchored off the coast of Miami, but U.S. Coast Guard ships and planes stayed nearby to prevent anyone from attempting to enter the country. Likewise, officials from Canada said the refugees would not be welcomed should they attempt to land in Nova Scotia. But it was thanks to the ship’s German captain — Gustav Schroeder — who years later would be honored in Israel at the Yad Vasham Holocaust Memorial as a righteous individual — that they eventually found port. Schroeder, who promised the passengers he would run the ship aground off the shore of England before returning them to Germany, ultimately helped them to safe harbor in England, France, Belgium and the Netherlands, respectively. However, some of them would later be rounded up and sent to concentration camps anyway, following subsequent occupations by the Nazis. Following the screening of the film to about 75 people, various questions posed to the survivors and the producer included one of why Jews in the United States were not more vocal about the incident at that time, as it was widely publicized. “The thing we hear most often is, ‘We didn’t want to rock the boat,’ ” Krakow said, with Roosevelt experiencing popularity among Jewish voters. Steel and Wiener shared various feelings of loss and anger they have had to process over the years, but each maintains the importance of keeping the history alive and relevant. “Learning history will hopefully protect us from reliving it,” Wiener said. “God forbid the world should experience this again. “It’s not just the 6 million Jews. The figure is 11 million,” she said, and maybe as many as 17 million by some counts. Wiener pointed out that fewer Holocaust survivors are around to bear witness, which is why she urges young people especially to keep sharing the stories.